AirPura H600W (H600-W) Allergy Relief Central Air Purifier provides continuous air filtration in the whole house from all microscopic allergens and dust, light chemicals and odors through the air duct of a house's central ventilation and air conditioning system. AirPura H600W All purpose Central air purifier has the same purpose as AirPura H600 portable air purifier - to provide effective filtration of the air from all harmful airborne contaminants and bring relief to allergy and asthma sufferers. This goal is achieved by using large high efficiency True HEPA filter, while the lightweight HI-C activated carbon filter barrier provides and adequate removal of common household chemicals and odors. Unlike the portable air purifier, the AirPura H600W Central air purifier is connected to the air duct of a central ventilation and air conditioning system (HVAC / furnace), and therefore purifies the entire volume of air distributed throughout the whole house. When to Use AirPura H600W Air Purifier? AirPura H600W central air purifier should be used to provide an effective cleaning of the air from all microscopic allergens and dust to maintain clean allergen-free environment needed for allergy and asthma sufferers and for adequate removal of regular household chemicals and odors in houses up to 2000 sq. ft. 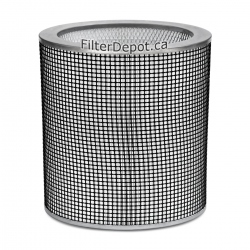 True HEPA filter has a guaranteed filtration efficiency of over 99.97% in trapping all microscopic airborne contaminants down to 0.3 micron in size to provide a superior level of protection from lung damaging dust, allergens, cigarette smoke, etc. 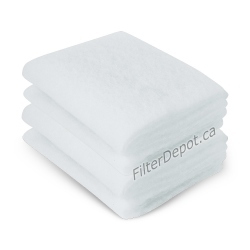 The large amount of True HEPA filter media used (40 sq. 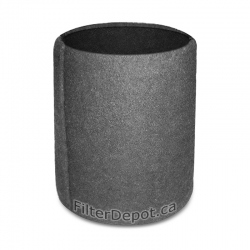 ft) ensures the long filter's lifetime - up to 3 to 5 + years. Instead of large activated carbon canister with 18 lbs. 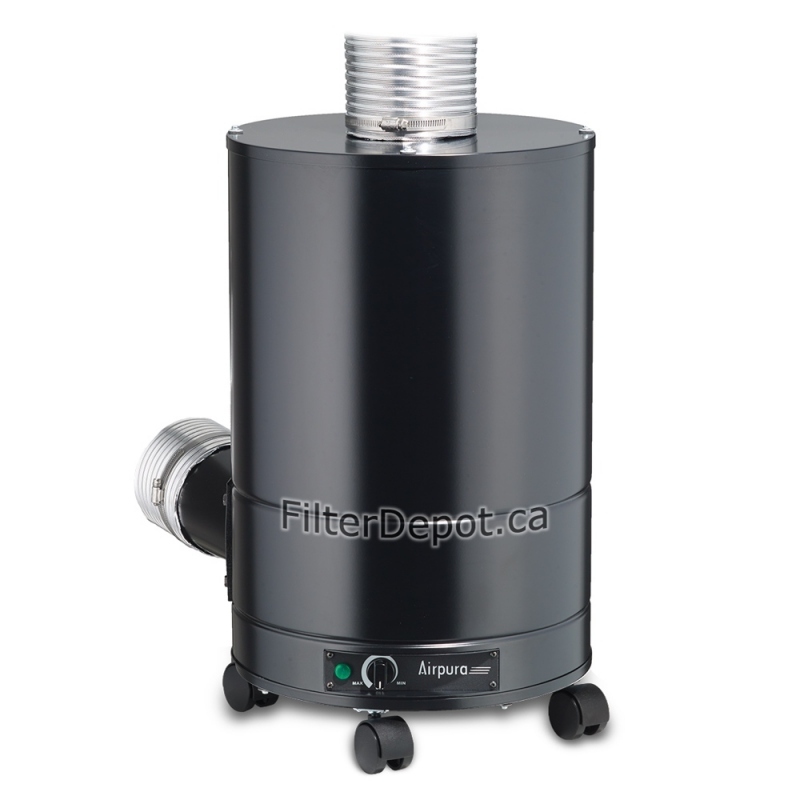 of granulated carbon adsorbent, AirPura H600W employs a lightweight HI-C carbon weave filter that provides an adequate removal of most household chemicals and noxious odors. It also makes the units about 16 lbs. lighter - easier to carry and handle during the transportation and installation. The Polyester based Pre-filter is the the first stage of the air filtration system of AirPura H600W central air purifier. 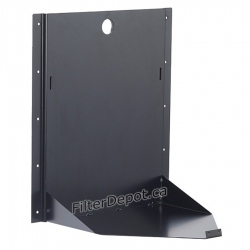 The pre-filter traps larger visible dust and dirt particles, thus helping protect fine True HEPA filter from faster contamination and extend its lifetime. AirPura H600W Powerful Energy Efficient Motor Fan Assembly. AirPura H600W employs powerful, yet energy efficient Motor/Fan assembly with variable speed control rated at 560 CFM (open air). AirPura H600W Power Supply Options. 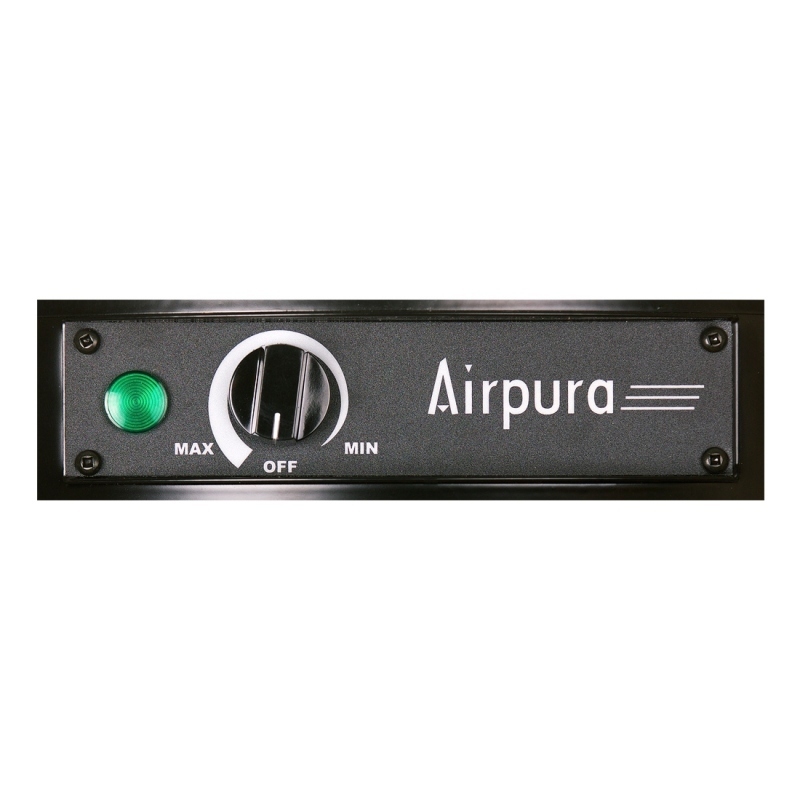 AirPura H600W Durable All Metal Housing. AirPura H600W features durable, impact resistant the all metal enclosed housing design. AirPura H600W central air purifier is available in a single color - Black. To ensure simple connection to the air duct, the AirPura H600W central air purifier is equipped with standard 5-inch hose attachment for both Polluted air intake (top panel of the unit) and Clean air outlet (bottom of the unit on its side). AirPura H600W air purifier comes with the most comprehensive limited manufacturer's warranty. If used as a central air purifier, AirPura H600W requires connection (hook-up) to the furnace's (HVAC) air duct using the 5" diameter flexible or rigid hose. The AirPura H600W whole house air purifier can be installed Free standing or using the optional Wall brackets. 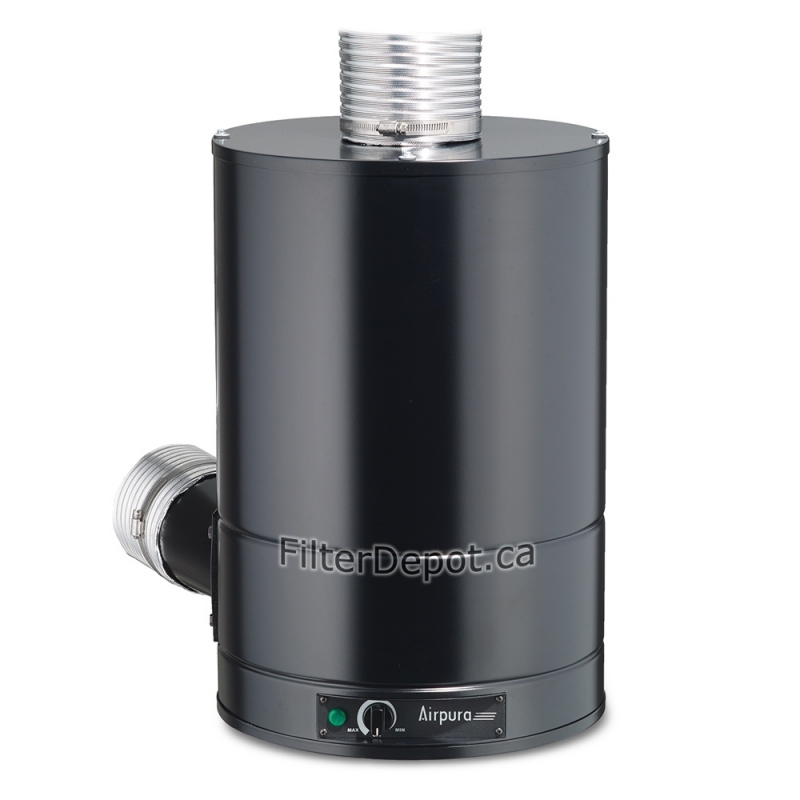 AirPura H600W air purifiers ship free of charge by FedEx Ground delivery service in Canada and the Continental USA.